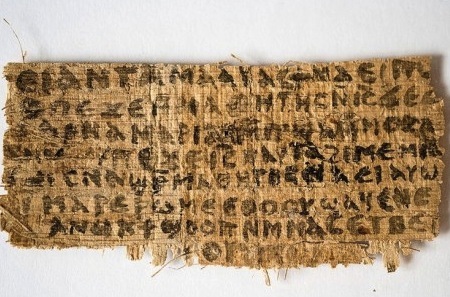 An ancient fragment was first publicized to the modern world in September of 2012 which features the words, “Jesus said to them my wife….” This created a frenzy of speculation about the possibility that Jesus was married. I am absolutely sure he was not. I can also say that, as an evangelical Protestant, it really doesn’t matter to me theologically whether or not he was. (For my celibate brothers and sisters in the Catholic Church’s leadership, I could see how there would be more concern.) But though his marital status doesn’t matter, it’s absolutely critical that everyone know he was single. Here’s why. 1. 700 years later is a stretch in terms of reliability. This would be roughly the equivalent of us finding a document dating from 1983 claiming that St. Francis was married. It’s a little hard to be convinced. 2. There is not multiple attestation, and no subsequent confirmation. One fragment, and a late one at that, shouldn’t merit serious consideration. 3. Marriage was the norm for Jewish men in Jesus’ day. It would not have been scandalous for him to have been married, and thus there would have been no need to keep it secret if it were in fact the case. It also isn’t odd that he was single, as even the Apostle Paul encouraged singleness, using himself as an example (1 Cor. 7). 4. The gospel writers include some really embarrassing stories about Jesus’ life (baptized though sinless, fighting with the religious leaders who should have endorsed him, rejected by eye witnesses, mocked, cursed to hang on a tree – Deut. 21:23, strange post-resurrection sightings that weren’t immediately recognizable). They really don’t hold back on provocative and incriminating details. The idea that there was a wife-hiding conspiracy doesn’t jibe with the nature of the gospels. 5. Luke claims to be doing research on Jesus’ life in the first generation, and a marriage would have been an impossible oversight. Here’s why the fragment matters. It opens up the implication to casual modern listeners that the history of Jesus has always been mistaken, and that there are secrets about him left untold, making the biblical story appear to be an official front masking the true story. And this is the real damage done by the publicity of this document and by the gnostic writings generally. The Bible is the real thing. Its story is so scandalous and conspiratorial that it doesn’t need a scandal to make it juicy. There was no great cover-up in its writing or compilation that changed the meaning of Jesus’ life. There aren’t parts of it that are waiting to be discovered in order to complete our picture of Jesus. We know of him what we need to know to believe in him and to live faithfully in his name. Whatever else the Bible is, it’s good enough. No new discovery is going to change the power it still has call people from death to life. So for the record, he wasn’t married, and if we are clear-headed thinkers, it ought to take more than a never before heard of scrap of paper written 700 years later to make us think the biblical authors just forgot that detail. You really `knocked it out of the park’ in this blog. I love your concluding line, “Whatever else the Bible is, it’s good enough.” It has been the “power of God unto salvation” for countless people across 2,000 years, and is still “good enough” for 2.3 billion confessing Christians world-wide today.